In addition to its own progress on proving up large gas resources in the Cooper Basin, the good news for RLE is that it is playing in a sector which has been tipped for consolidation, via mergers and acquisitions. We’ve covered off on RLE before, and the signs continue to look good for this emerging Cooper Basin gas player. Although things have been a little quiet recently, RLE is still on track and about to embark on the first step of turning its promising geology into vital flow rates. Should the flow rates come off at two key wells, RLE could be a step closer toward completing a major deal. In fact, with a market cap of about $19 million, RLE is in the middle of swinging a deal which could be worth a potential $800 million in revenue over 10 years. A potential revenue pipeline over 40 times your market cap sounds pretty compelling to us. However this is by no means a done deal, and any talk of future revenues is pure speculation – so its recommended investors seek professional advice should be sought if considering RLE for your portfolio. So, the oil and gas industry as a whole is likely to be looking at these results pretty closely; given it’s an industry which has been tipped to be in the market for a cheeky acquisition or two in 2016. RLE is expected to commence its five stage fracture stimulation programme in the Toolachee-Patchawarra formations in the coming days. It has already commenced work over operations in preparation for programme to begin. The programme will test the formation below 2300 metres and is an important step in its move towards commercialisation. 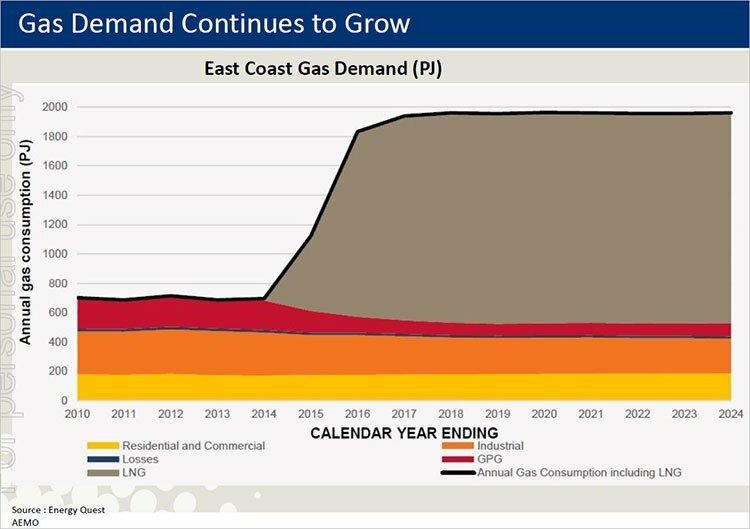 Assuming the testing proves the viability of its project, RLE is well placed to take full advantage of the growing demand for east coast gas. In this article, we’ll run you through the RLE playbook, take a closer look at how it plans to close a potential $800 million deal, and what positive flow rates for this aspiring junior could mean. 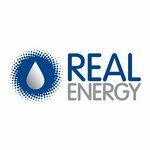 You can read the back story of Real Energy (ASX:RLE) in several articles we have written in the past. It began in 2014 with International Feeding Frenzy in Australia’s Hottest Shale Gas Region Puts Undervalued Junior on M&A Radar and since then we have covered the success of their first well: Success for RLE on First Exploration Well – Follow Up Drill Coming Soon , and the moment RLE cashed up in Next Door to Santos: RLE is Cashed Up and Ready to Frac . The focus now is RLE’s intent to prove up its gas resource in the Windorah Trough, and it has the funds to do so – at December 31 st last year it had $10.7 million in cash. RLE is also continuing discussions for additional financing and offtake arrangements. RLE also has equipment in place and Haliburton on deck ready to undertake the stimulation programme, which is set to start any day now. 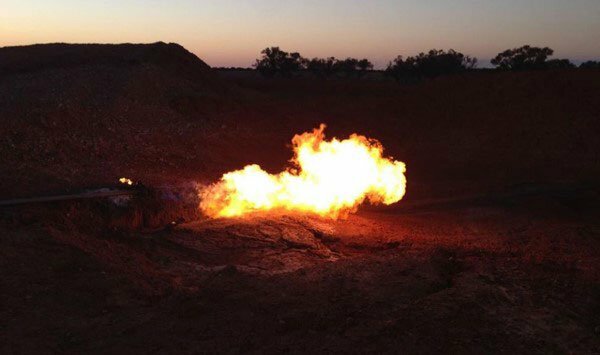 Meanwhile, RLE’s neighbours have been doing some drilling of their own, and the biggest news is that three wells were drilled next to RLE’s ground in the Windorah Trough: Whanto East-1, Cougar East-1 and Whanto West-1. All wells reported gas discoveries – an excellent sign for RLE, and another sign that the ground RLE is on is highly prospective. This prospective ground was in further in evidence when the $580M capped Beach Energy Limited (ASX:BPT) announced that its Whanto West-1 programme indicated potential for an extensive gas accumulation and a new play in the area. It also said that in its Windorah-Marama development its flow rates are exceeding its initial eight-well connection programme. So let’s have a look at the broad play. RLE is smack-bang in the middle of the most productive onshore oil and gas region in Australia, the Cooper Basin. It’s responsible for a large chunk of eastern Australia’s oil and gas needs, and has been producing big quantities since about the 1960s. In fact, by some estimates more than 6 trillion cubic feet of gas and 300 million barrels of oil have been produced, with over 3000 wells drilled since that time. In short, this is the hottest of postcodes for onshore oil and gas. Like the US, the Cooper Basin has felt the weight of the hydraulic fracturing revolution. While wells in the Cooper Basin have been hydraulically fractured for a number of years, it’s only in recent times that deeper and tighter rocks have been able to be tapped with regularity. 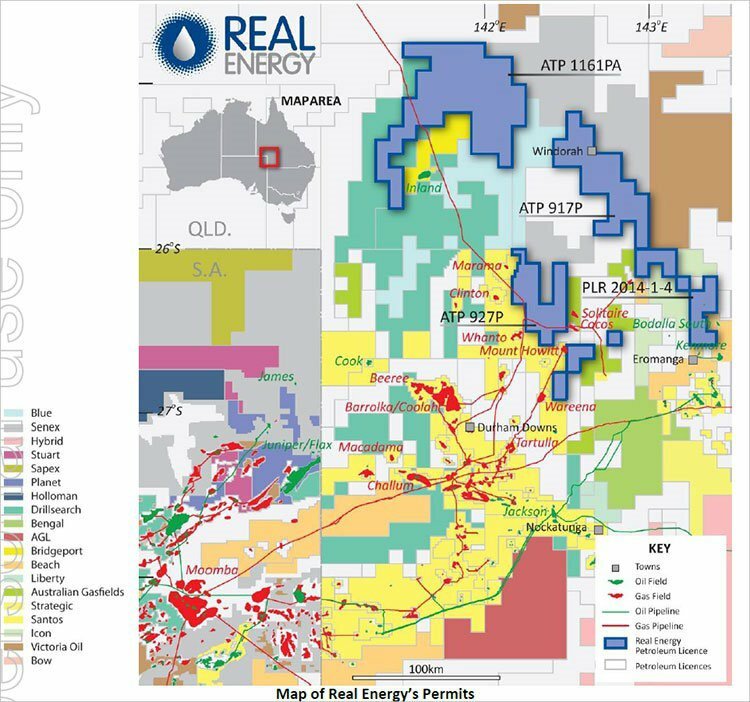 As you can see, RLE’s permits in the blue above, are surrounded by a plethora of other oil and gas companies all chasing the big payday, including the likes of Santos, AGL, Senex, and Drillsearch. Interestingly, a joint venture involving Santos, Beach Energy, and Origin Energy has drilled 16 wells on adjoining blocks over the previous years, and all of them have been cased and suspended as future producers. This means that the joint venture thinks that the wells will more than likely produce in the future, but there is also more evidence to go on elsewhere for the companies to put the wells into production immediately. But RLE is focusing on more than simple ‘nearology’. All in all, RLE has its foot on a total of four permits in the basin with a combined footprint of 9523 sq.km. Looking a bit closer, RLE is focused on proving up a geological feature known as the Windorah Trough. RLE is aiming to tap both the Toolachee and Patchawarra formations, both prolific producers in other parts of the Cooper Basin. However, they haven’t yet been proved up as proven producers in this trough... yet. The Tamarama-1 well was the first drilled by RLE, followed by Queenscliff-1, and both were drilled to tap the Toolachee/Patchawarra Formation – you can see the location and depths of the wells on the map above – RLE’s wells are marked in blue. Tamarama-1 and Queenscliff-1 are the stars of the show for RLE, and their flow rates without hydraulic fracturing piqued the curiosity of an industrial giant (more on this later). Both wells were drilled at the back end of 2014, but were tested in the first half of 2015. When you’re dealing with all the technical difficulties hard rock like shale can present, you make sure you’re doing things by the book. The first bit of intriguing news was that gas flowed to the surface at Queenscliff-1 without any stimulation , flowing at 200,000 cubic feet of gas per day on clean-up flow. The entire point of drilling the two wells was to prove that there was ‘moveable’ gas from the formations. At least at Queenscliff-1, mission accomplished. RLE, however, was able to repeat the trick at the shallower Tamarama-1. 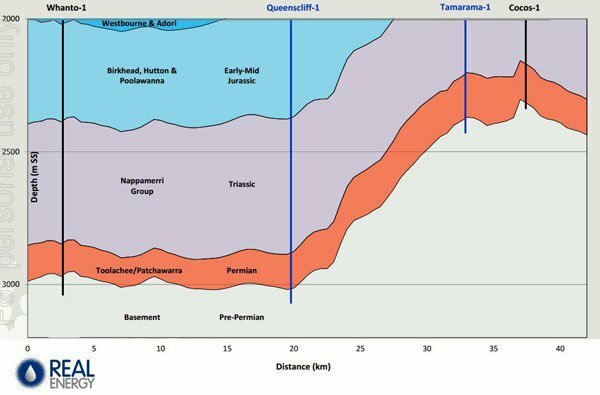 Tamarama-1 hit two zones in the Toolachee formation, with a flow rate of 460,000 cubic feet of gas per day, and found a flow rate in the Patchawarra of 330,000 cubic feet of gas per day. Combining it all, RLE’s Tamarama-1 well found 790,000 cubic feet per day. There’s nothing quite like the sight of a flare to tell the market that you have gas flowing to the surface (plus it’s more environmentally friendly than letting methane into the atmosphere). Interestingly, analysis of gas samples showed that the gas from the flow contained just 7% carbon dioxide. When you end up selling gas, you need to strip out the carbon dioxide, so having gas with low CO 2 content is considered somewhat of a godsend. Throughout the year, RLE conducted shut-in testing to gauge different reservoir properties, and basically doing all the technical work needed to get the wells ready for fraccing and figure out the forward plan (more on that later, too). On the back of the drilling and subsequent flows, RLE was able to book some impressive numbers. Thanks to the drilling of Queenscliff-1 and Tamarama-1, RLE was able to increase its total mean gas in place figure up to 13.76 trillion cubic feet of gas. That was an increase of 141% on pre-drill estimates. The new numbers came from independent assessors DeGolyer and MacNaughton, and took into account the drilling and a whole host of geotechnical data RLE had gathered since it started the project. The ‘in-place’ figure is basically a guide as to how large the petroleum reservoir could be. RLE, however, published more numbers. It gave shareholders both a contingent resources update and a prospective resources update. As a bit of a rough guide, contingent resources are thought to be quantities of petroleum which could be recoverable from known accumulations, but are not considered ready for commercial development. The 1C, 2C, and 3C estimates are all varying degrees of certainty, with 1C being the most certain and the 3C being less so. On the other hand , prospective resources is a measure of petroleum which may be potentially recoverable from undiscovered accumulations. While the resource sizes above appear pretty good, the thing to remember here is that they are pretty contingent on a lot of things happening, so it’s probably not good practice to judge RLE’s fortunes entirely by them. Besides, the numbers are based off wells which have not been fracced. In the Cooper Basin, hydraulic fracturing can lead to higher flow rates as the practice opens fissures and allows gas to flow more freely. For those of you uninitiated, hydraulic fracturing is the practice of creating fissures in hard rock such as shale rock, and then flooding the fissures with a liquid known as ‘proppant’, which contains small amounts of sand which hold the fissures open, allowing the gas to flow. The fraccing of the formations being tapped by RLE have the potential to put flow on supercharge. To that end, and the back end of last year it tapped the venerable Halliburton, one of the most experienced fraccing crews in the world, to conduct fraccing on both Queenscliff-1 and Tamarama-1. Should it come off, this has the potential to transform RLE from a junior, to a junior with one hell of a carrot to lure potential investors. However, there is no guarantee that the fraccing operation will be a success, and caution is advised when considering RLE as an investment – this is a speculative stock. RLE’s work in the Cooper Basin has caught the attention of several people looking at the basin closely, but it’s the interest of industrial giant Incitec Pivot which has the potential to transform RLE into something massive. Last May RLE signed a non-binding letter of intent with Incitec for a 10-year supply deal, or 100 petajoules of gas, on the back of the drilling. At current market prices this works out at about $800 million over the life of the potential deal, but we must stress it’s only a potential deal. Incitec and RLE signed a LOI on the proviso that they work towards a definitive agreement. So this is currently far from being the finished article, and it gives RLE scope to talk to other interested parties should they be able to lob in another offer. So why is Incitec Pivot, a massive chemicals company with a market cap of nearly $6 Billion (yes, with a ‘B’), taking an interest in little ol’ RLE? The answer may lay in the chart below. While these projections are thought to be on the higher end of estimates, particularly for industrial usage, the demand added by the LNG players in Queensland is very, very real. These are simply huge projects, and they haven’t been able to meet all the project requirements themselves. Thanks to some early issues around coal seam gas flow rates, the LNG players have had to dip into the open market to secure gas in the early stages of project life. This has effectively sucked a lot of the uncontracted gas on the market away from domestic projects. One of the chief ingredients in chemical manufacturing is gas, and it happens to be an energy-intensive process. Incitec is playing a long game here. It’s trying to secure the future of its business, and it needs to lock down a gas supply in the absence of a plethora of third party opportunities to do so. The low oil price will also discourage the sort of high impact exploration which may result in the kind of volumes a company like Incitec needs. Hence, it’s taken a nibble at what RLE is doing. Should the LOI result in a concrete sales contract, Incitec will throw in $35 million into the development of the project. That’s how much it wants to secure gas. It’s been an emerging trend for a few years in the oil and gas industry, with the industrial sector effectively becoming partners in upstream projects. The gas industry on the eastern coast, at the moment, is the very definition of a seller’s market. The question is, why would you ever invest in an oil and gas company? Have you seen the oil price at the moment? It’s pretty horrendous out there. Surely you can’t turn a decent amount of coin as a junior these days? That’s the conventional wisdom, anyhow. A low price oil environment, however, creates some unique opportunities RLE could be at the centre of. Last year saw some M&A activity in the Cooper Basin with the $380 million takeover of Drillsearch by Beach Energy, and this year is expected to be hotter for M&A activity more broadly. Recently global consultancy IHS said it expected the gap between seller and buyer’s perceptions to close as the oil price continues to be low. Last year, it argued, potential takeover targets put way too much value in their assets for potential buyers to be interested. This year, with the oil price continuing to ride low, sellers could start to get a lot more realistic about their assets. With weaker valuations floating around, it could just tempt more buyers to the oil and gas market to pick up cheap assets. Bernstein Research backed up the sentiment. “We expect companies with stronger balance sheets will start to acquire resource-rich but cash-poor E&Ps [exploration and production companies] as it becomes cheaper to drill in the stock market than in the ground,” Fairfax Media quoted senior analyst Neil Beveridge said. Last year, there may have been a touch of uncertainty about where the oil price is going. However, should oil prices hold at current levels, there’ll be nothing uncertain about it. “The case for consolidation is clear: equity values have been battered, particularly those of higher-leveraged companies, to the point where strategic buyers (other energy companies) and non-traditional buyers (private equity, sovereigns and pension funds) are swooping on assets and companies,” RBC Capital Markets’ Ben Wilson said. We should note that these comments are more than likely aimed at the mid-to-high end of the market, but there’s no reason a smaller company such as RLE can’t get swept up in the momentum. One of the points Wilson makes is that non-traditional buyers such as private equity and sovereign funds are being lured into a cash-splash across sectors thanks to the availability of cheap credit. This means the market has just been opened to a whole bunch of new buyers who may not have gotten a look in before the oil price crash. Now, consider that RLE has a market cap of less than $20 million, a cash pile of over $10 million, and a potential deal in the works of $800 million over 10 years. There aren’t a whole stack of buying opportunities with a revenue pipeline worth 40 times their market cap. Yet, there are certainly those opportunities for growth at the mid-to-high end of the market. Could a canny buyer end up making a play for RLE? The upcoming fraccing and subsequent flow testing of both [wells] should tell the market more. We should remind readers at this point at time that a lot of this is pure speculation, and there’s no guarantee an offer will ever eventuate, so seek professional investment advice before choosing to invest here. RLE is about to enter a crucial stage in its development as it begins its fraccing programme. So far, it’s done everything in the playbook right. RLE has drilled a couple of wells in a proven petroleum province, and gotten them to flow without the assistance of hydraulic fracturing. It’s attracted the attention of a deep-pocketed industrial partner. And now, starting with the well stimulation programmes, RLE embarks on a year which could end up putting the company on the path toward turning its sub-$20 million market cap into an $800 million deal.